LINC Housing joined with the City of Los Angeles, the Los Angeles County Community Development Commission, the California Department of Housing and Community Development, and other partners to celebrate the start of construction at Mosaic Gardens at Westlake, an all-new 125-home affordable apartment community near Downtown Los Angeles. 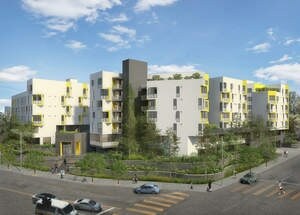 "I am thrilled to welcome Mosaic Gardens to the 13th Council District, and to work with a great partner in LINC Housing to build this sorely needed affordable housing development in the Westlake community," said Mitch O'Farrell, Councilmember, 13th Council District, City of Los Angeles. "In addition, this project allows 63 units specifically for extremely low-income individuals and will provide the health resources and supportive services to help them succeed." The new development is part of LINC Housing's commitment to integrate affordable housing with health resources and other services for stronger neighborhoods. LINC's partnership with the Los Angeles County Department of Health Services and Ocean Park Community Center will allow the nonprofit to support 63 formerly homeless households through intensive case management including mental health and physical health services, employment counseling and job placement, education, substance abuse counseling, money management, assistance in obtaining and maintaining benefits, and referrals to community-based services and resources. "LINC and our partners are creating real change in this neighborhood with new affordable housing for families and seniors, helping solve Los Angeles' homeless crisis, and creating hundreds of construction and long-term jobs," said Rebecca Clark, LINC president and CEO. "And we're not just going to build the complex and leave. We're in it for the long term, providing supportive services for the seniors and families who will call Mosaic Gardens at Westlake their home."